Already posted. 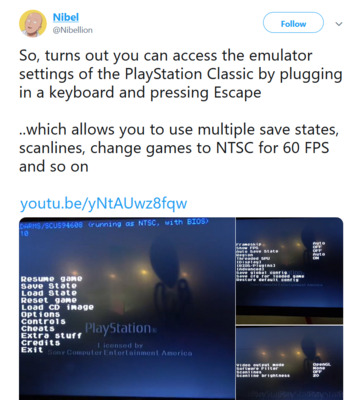 And the emulatioj ain't great according to those who have used it. PAL versions? Nintendo has no issue using NA ROMs even in Europe, they've even boasted of it as a selling point. Are we sure it wasn't AtTames who cooked this up?! This is really sloppy by Sony's standards. I was going to buy this, but with everything that has transpired I decided against it and instead I'm going to be building my own out of a raspberry Pi and it'll be cheaper (even though I'm going overkill on the USB flash drives). To the Pokémon fans who didn't like the Detective Pikachu designs, I present to you, PERSPECTIVE!! <blockquote class="twitter-tweet" data-lang="en"><p lang="en" dir="ltr">The guys that brought you Deadpool &amp; The Fast and the Furious are bringing SONIC THE HEDGEHOG to the big screen! <a href="#SonicMovie hashtag on Twitter">#SonicMovie</a> speeds into theatres Nov 2019. <br><br>Check out the new teaser poster, and click to read what they had to say about making the film: <a href="Sonic The Hedgehog Movie First Look: Check Out the Exclusive Official Poster - IGN">Sonic The Hedgehog Movie First Look: Check Out the Exclusive Official Poster - IGN</a> <a href="Paramount Pictures on Twitter">pic.twitter.com/LMakeasL6y</a></p>&mdash; Paramount Pictures (@ParamountPics) <a href="
That's not sonic! That's squatnic the swolehog! Looks like they’re going OOP again. I reckon a Switch release alongside a P4G port amongst other things. I’d rebuy P5 if it had enough worthwhile additions. There was a PlayStation symbol at the start! So a new game similar to P4G, on the Vita? (It's not quite dead yet in Japan) or on the PS4? Seems a bit late for it to be DLC. I mainly think a Switch port because of the Smash situation though I’m probably wrong. I doubt It’s anything for the Vita though. The vita is long dead and doubt could handle it. That already has PQ2 though. Looking through Wikipedia it would follow the pattern of all main line Persona games being exclusively on a Sony console and then ported exclusively to the portable Sony handheld. It also reminded me that P5 also came out on PS3, so a Vita port is plausible. I don't know if they could do it with Persona 6 if it was a PS4/5 game, unless Sony tried again with handheld. OK, Nintendo has its Persona games, just not the main line ones. Must be some kind of deal between Atlus and Sony for those.